After a settling day in Milan I hit the road doing proper bike rides. 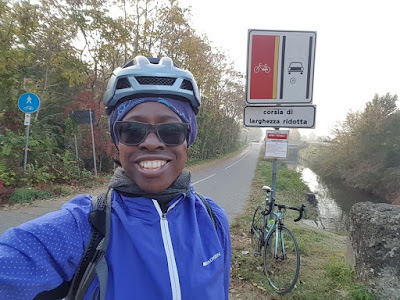 One day was an easy outing along the Navigli Grande and Pavese, the next day was a hilly ride around Lake Como and up Ghisallo. In an ideal world this would have been my southern Lombardy bike ride, going past Pavia and into the Oltrepo Pavese area. I had it mapped out in mind, to get down to Casteggio and do a loop from there, taking in places like the hilltop village of Montalto Pavese, Salice Terme, and maybe even Zavartarello - places on the edge of Lombardy province, bordering on Piedmont and into the wine region that not a lot of people know about (and which I would say is a mini version of Tuscany). Unfortunately, I wasn't actually feeling great and was on the verge of getting a cold, so had to take it easy rather than climbing too many hills. In any case time was not on my side. I made an attempt at a getaway in that direction, but the traffic first thing in the morning was pants, even though we were travelling away from Milan. So with all of that conspiring against me I made an executive decision to stop somewhere near Chiesa Rossa and start my ride from there. This town is know as the official start line of the Milan-Sanremo professional bike race (rather than the ceremonial parade from Central Milan) and I decided to make it my official start too for my flat bike ride, rather than taxing myself in the hills. These canal paths or Navigli are great cycle routes for if you're wanting to get out of town. There are three that lead from central Milan to small surrounding towns roughly 20 miles away. 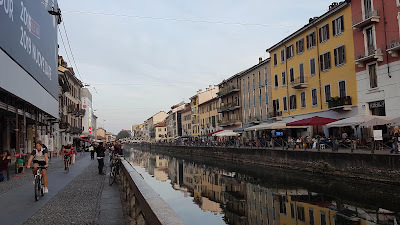 The Naviglio Pavese and Naviglio Grande are near one another and both start from the Darsena channel near Piazza 25 Maggio among all the bars and restaurants. The third, Naviglio Martesana is more to the North-east of the city, past the Stazione Centrale. Since the time I lived there they have been smartened up with the paths resurfaced, sign-posting put up and distance markings painted on the ground. From where I parked I got onto the Naviglio Pavese and headed south towards Pavia. 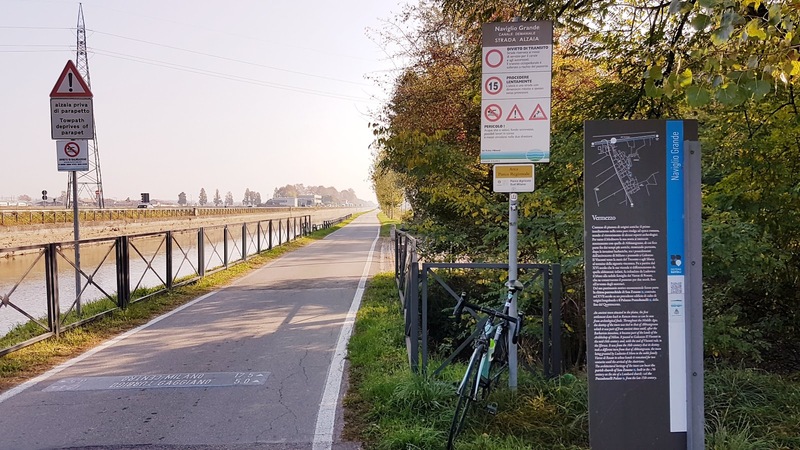 This canal path, which leads from central Milan to just outside the picturesque town of Pavia (which to me looks like little Florence), is a great place for riders of all persuasions. And that's what I saw along the way. There were people using it as their commute to get to work, others were out for a leisurely bike ride, though not in great numbers given that it was a foggy Friday morning. Then there were the harder core club riders who rode it like they were on a mission, some perhaps trying to beat their Strava record. Whatever church the rider belonged to, they all said "Ciao"as they passed me. 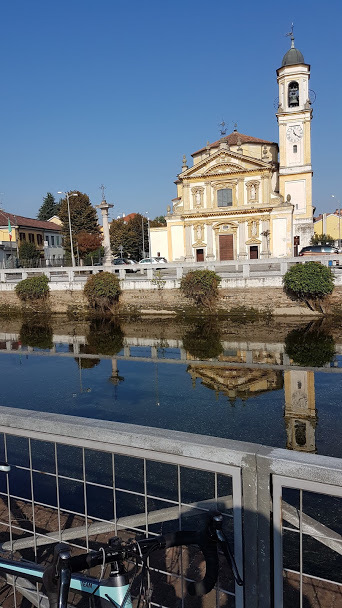 This Naviglio passes various villages and hamlets, and if you have time there are a couple of churches, monuments, and relics from a bygone age of functioning canals you can visit. There's even a museum of coffee making machines nearby if that's your thing. But I didn't have time to do that during my ride. By the time I reached Certosa di Pavia the fog had become quite thick, and it was getting sketchy, even trying to see other riders a short distance away. 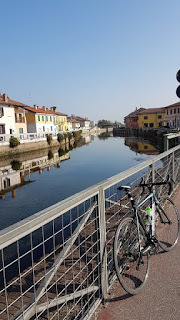 So I turned around and headed towards Milan, which was bathed in sunshine, where at Binasco I left the Naviglio Pavese and cycled west to pick up the Naviglio Grande. The roads in between these two canal paths are to be endured rather than enjoyed. They're not so busy give or take the odd truck, but they are not particularly picturesque. There are plenty of factories and arable farms if you like looking at that sort of thing, and then every now and again you get a random prostitute near a lorry park. Oh, well. No, this aint no Tuscany - just a criss cross of suburban roads to get you to the various motorways; roads that take you through commercial and industrial areas that help make the Milan economy one of the strongest in Italy. Thankfully, I was soon back onto the pretty Naviglio Grande, which has a suburban forest and picnic areas as well as ornate churches at Gaggiano and Trezzano. For those into open water swimming, something I have dipped my toe in, there is a swimming race from central Milan out to Abbiategrasso. The paths and surrounding areas are definitely pleasant, but the water might be another story! One short section along the path that was closed for maintenance. With bollards blocking us off and heavy machinery in sight there was no way of passing through there, even on foot. So I was obliged to take a diversion. I could see a path that appeared to cut across fields to get around the the works and wondered if it was worth trying that option rather than making a 3-mile diversion, or riding along the very busy parallel road. It was interesting seeing the varying pieces of advice from the different local riders I asked. A few just said, "Absolutely not - you'll definitely get a puncture." They also looked like they wouldn't have even wanted the slightest fleck of dust on their flashy steeds. A couple of others just said, it is possible to get through but I had to "be very careful". In the end I took the short cut, and to be honest, I don't know what all the fuss had been about. The road surface was nowhere as bad as pave in Paris-Roubaix - not even a bit of Strade Bianche. These Italian guys were real snowflakes! I bet they don't ride when the sun's not shining either! So I continued along my way and returned to my base in the sunshine near Chiesa Rossa. By the time I finished it was lunchtime and many more cyclists and club runs had come out, making the most of this very pleasant Friday afternoon. 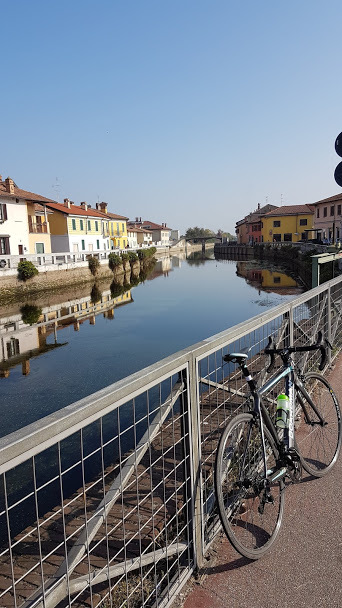 I was pleased with my Naviglio ride, though I still have it on my list to ride in Oltrepo Pavese the next time I am in Lombardy - and I will even drink some wine.